In the last in our series of blogs about the Action Plan for turtle doves, Ian Fisher and Joscelyne Ashpole from the RSPB reflect on the work that has gone into the plan, celebrate the ‘Eyes on the Flyways’ conference and look to the future. Ian presents the Turtle Dove Action Plan at the ‘Eyes on the Flyways’ conference. For the last two years we have been pulling together the Turtle Dove Action Plan, with Carles (see Carles’ blog here) dealing with every tricky technical question about modelling populations. This mammoth task has sometimes been rewarding, sometimes frustrating, and involved reading the plan from cover to cover more times than we had ever anticipated! However, overall it has been a project where we have met some incredible people and seen a heart-warming level of international cooperation to develop a plan that delivers a new world for this declining species. It has had its highs (such as the Eyes on the Flyways Conference to deliver the work to the European Commission) and its lows (fear of a pitched battle between opposing parties at one of the workshops), but we got there in the end – a plan that will tackle agricultural problems on the breeding grounds, delivering vital nesting habitat, food and water, and that implements a temporary suspension of hunting of the species until this can be shown to be sustainable in the 10 EU Member States where the turtle dove is legal quarry. The turtle-dove range extends into North Africa for breeding, with most birds wintering in West Africa, and these range states have also input into the plan, along with countries to the east, including Russia and Israel. In some places illegal killing needs to be addressed, in others loss of wintering habitat. 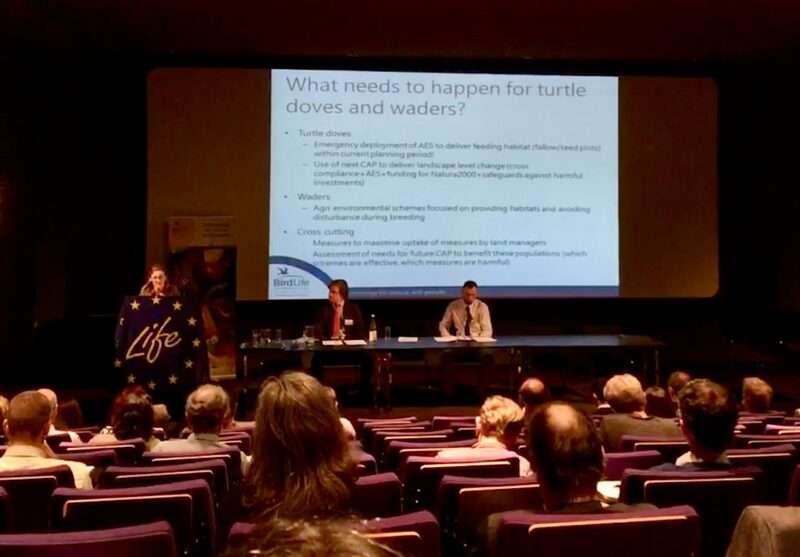 BirdLife’s Harriet Bradley presenting what needs to happen for turtle doves during a panel discussion on land use changes. At BirdLife’s ‘Eyes on the Flyways’ conference in Brussels, we had the chance to celebrate this vital document for turtle dove conservation and the many contributors who have made it the detailed, focussed and ambitious document that it is today. It was particularly exciting to hear about the steps already being taken to implement some of the actions in the document, such as plans for developing Adaptive Harvest Management for the species. 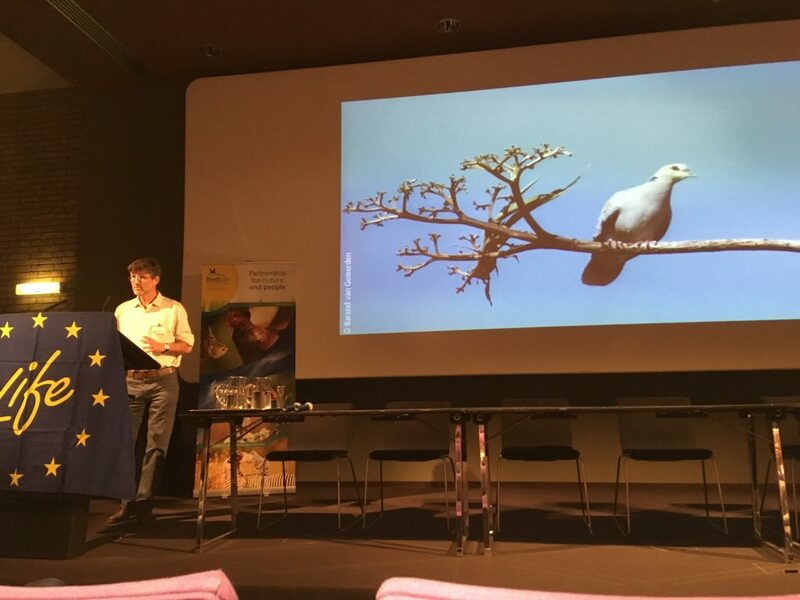 The conference was also a fantastic opportunity to hear about the other Action Plans that have been developed alongside the turtle dove plan – from vultures to Dalmatian Pelicans. These new Action Plans give us reason to hope that the uncertain futures of many of these charismatic and declining migratory species are now a little brighter, thanks to coordinated, international plans that will guide the future conservation of these birds. A key message throughout this process has been that the Action Plan, despite the two-and-a-bit years of development, is just the beginning – setting the scene and laying out the actions that need to be carried out. Our next challenge is to make sure that turtle doves are doing well across Europe by the time we are in our dotage – and the only way for that to happen is if the actions are implemented.